Held annually in Bonner Springs, Kansas, the Kansas City Renaissance Festival begins on Sep. 1 and runs through Oct. 14 at the Kansas City Renaissance Festival Fairgrounds located at 633 North 130th Street. Open every Saturday and Sunday along with Columbus Day and Labor Day, the Renaissance fair was started in 1977 as a tribute to the Kansas City Art Institute and rose in recognition as a separate festival towards the late 1990s. Staying true to its creative foundation, the Kansas City Renaissance Festival features several shops that sell innovative arts and crafts. With its tree-laden lanes, decorated paintings and whimsically wreathed architecture, the site is a delightful re-creation of the historical Renaissance period. 2018 marks our 56th Anniversary! The Renaissance Pleasure Faire, where fantasy rules and whimsical delights take flight, where worlds co-exist and dreams come to life! Immerse yourself in a village of more than 1,500 costumed performers and artisans including dazzling acrobats, internationally acclaimed musicians and entertainers, juggling jokers and jesters, willful wenches…and jousting knights are ready to celebrate! Complete with 16th Century games, rides, arts, crafts, food, music and dance, recreating the celebratory spring day in 1574 when the world arrived to entertain Queen Elizabeth in the English Seaport of Deptford. Our thirteen stages of nonstop entertainment come to life with continuous performances from 10am until 7pm everyday! Our 2018 entertainment lineup features a wide variety of acts, from jousting to aerial silk dancers, from jugglers to musicians, from still walkers to magicians. There is something for everyone. This year, we are featuring new acts such as Aaron Bonk Whip Artist, the Tortuga Twins and Green Eggs and Hamlet, along with special guest appearances from Punch and Judy, Passado Action Theater, Jeremiah Wiggins and The Raven. We will also host our faire favorites with the likes of MooNie! The Magnif’cent, The Clan Tynker Family Circus, Broon and Brandon Scott: The Wizard of Wonder. Sing along with the beloved The Poxy Boggards and The Merry Wives of Windsor. Dance along with VaNa MaZi and Seraphim Arabesque. Feel the gust of wind blow ruffle your hair as the Birds of Prey fly just inches above you. -And of course, be sure to meet our beautiful and gracious, Queen Elizabeth. The Renaissance Pleasure Faire proudly boasts some of the finest festival food. Boasting local and internationally trained chefs, twenty-three food vendors offer an array of foods from fish and chips and sausages to salads and sorbets. Vegetarian and Vegan entrees and desserts are available. Our Pub Crawl is offered twice each day. On your journey, you will visit five of our village pubs for a time to tell jokes, make toasts and play games while enjoying the company of Deptford’s many characters. This will sell out, so stop by the Guest Services Gazebo inside the front gate to sign up! Deptford’s live action fantasy-play returns with a brand new story line in 2018. RenQuest brings the worldwide popularity of massively multiplayer online role-playing games into the live action dimension of the Renaissance fair, and offers gamers the chance to test their role-playing prowess beyond the realm of their computer screens. Come join Grace O’Malley and her hearty gang as they quest to solve the puzzle allowing her to seek her treasure! Escape your world and tackle the adventures that are RENQUEST! For more information on the Faire visit http://www.kcrenfest.com or call (913) 721-2110 or (800) 373-0357. The faire hours are 10 a.m. to 7 p.m. and parking is always free. Ahh, can you hear that? It’s the sound of shoppers across the Kansas City area buzzing in anticipation. Kansas City has been in a flurry of excitement ever since the large Swedish company announced its plans to build an Ikea in Merriam. Finally, on Wednesday, September 10th at 9:00 am, just shy of 2 years since that announcement, the 40th IKEA store in the United States will open its doors. I had the opportunity to take a tour of the new facility on Wednesday, and I have to say that I was NOT disappointed. Being a newbie to IKEA, I was unsure of what to expect. Walking through the doors, I half expected a choir of angels bellowing a harmonious “ahhhh”. Needless to say, I was disappointed on that point, but I was not let down on the “ahh factor”. The store has 3 levels with the Showroom at the top, a Marketplace in the middle, and the Self-Serve on the ground floor. After arriving onto the middle level, you are met with yet another escalator and an open space with a few professionally designed “inspirational room settings”, a tv with tiny blue stools and a door to the supervised children’s play area. Inside are boy’s and girl’s bathrooms, a water fountain, and a fun play area where we were told children can play freely, engage in reading, craft time and other various activities. Parents may sign their children in, go shop and not worry about the well-being of their children. Kids are supervised by store employees who have been specifically screened and trained in CPR. No adults other than store employees are allowed in the children’s area. Now how’s that for a convenient shopping experience, moms?! Once your kids are checked in safely, you can go upstairs to the showroom. This is where you can tour the 37 inspirational room settings, and 3 model home interiors that showcase the company’s 10,000 exclusively designed products. Be sure to bring your cameras, or smart phones, folks. You WILL get inspired, and may be in danger of maxing out your credit cards! The colors are bright and vibrant, and the designs are crisp, clean and elegant. The prices are oh-so-affordable. Yes, most of the wood furniture is pressed wood with veneer finishes, so if you’re looking for expensive hardwood pieces to pass down generation to generation, you are in the wrong place. But, if you like to decorate and have a hard time committing to one look for a long period of time, this is for you! Products look very high quality and with an amazing amount of options and interchangeable parts, you can make a look all your own. The fun part about the showroom is that they have a fun system that helps you coordinate, and also find the items you want to buy downstairs in the Marketplace. They provide nifty paper rulers, pencils and paper so you can measure the displays, write down your wish list, or record ideas. The home accents are beautiful too! They leave no wall untouched and show so many unusual ways to organize and use dead spaces. I found a very affordable item that I will be using to showcase my own work and organize my office. I can’t wait to return and purchase them! Once you’ve had a look at the showroom, you can stop in for a bite to eat in the 450 seat restaurant. The food area is laid out cafeteria style with you selecting the items you want from refrigerators and chefs calling out orders and handing you food from the other side. You can indulge in so many delectable Swedish treats. Try their famous Swedish meatballs, a freshly baked cinnamon roll, or a glass of their sparkling pear soda. The prices simply cannot be beat with a children’s meal starting at just $2.99. On another note, parents you may want to mark down that Tuesdays Kids eat FREE! I mean, absolutely free… no adult meal purchase required! After stopping for a bite to eat, you can go downstairs to the Marketplace where you can find all of the items that you saw in the showroom and put them in your bag to purchase. Products are organized according to room and color. Again, it is so organized and pleasing to the eye, any neat freak would be in heaven here! As you weave up and down aisles, you can gain inspiration at every turn. Upon going down the last flight of stairs, you find yourself in the Self-Serve area of the store where most of the larger pieces are stored and stocked. You may also find your way to the checkout lanes and pay for your items. By the checkout counters, there is also a small food market that boasts .50 all beef hotdogs and sells a few of the Swedish favorites you can find in the restaurant. I have to say, I’m looking forward to giving each and every item a very thorough taste test! After over 2 hours of tasting food and walking the showroom, I can honestly say that Ikea is going to be a big HIT with this community. Without a doubt I already know I will probably spend way too much time here, but at least the prices are low! I’m looking forward to opening day and am planning to be there with pocketbook in hand ready to spend some of my hard earned money at Ikea! Be sure to take a look at the official press release for all the details on all of their Grand Opening Giveaways! You won’t want to miss it!! The thirty- one Summer Catalog is Sizzling! The Summer catalog is sizzling! Beat the heat with one of our bags in fun new summer prints! Hosting a party is a great way to get new ideas, log some shopping time with your girlfriends, and earn exclusive Hostess items! Check out the catalog online or contact me today to receive one in the mail. 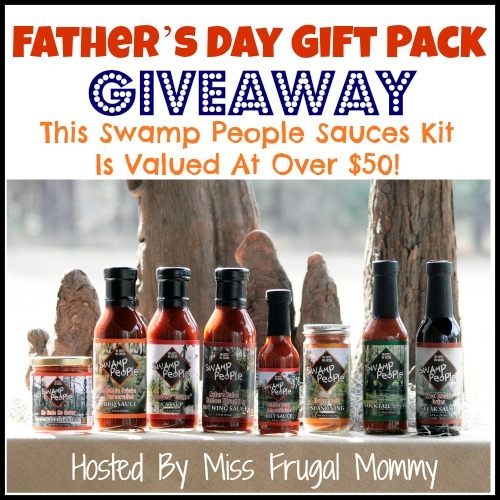 Father's Day Gift Pack Giveaway - $50 worth of Swamp People Sauces! 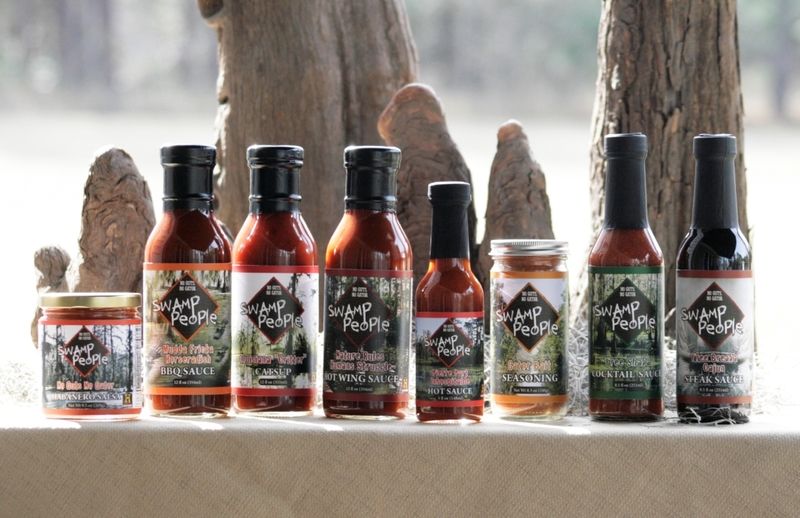 You can discover more about these savory and delicious sauces in Miss Frugal Mommy's review! Now for the exciting part! 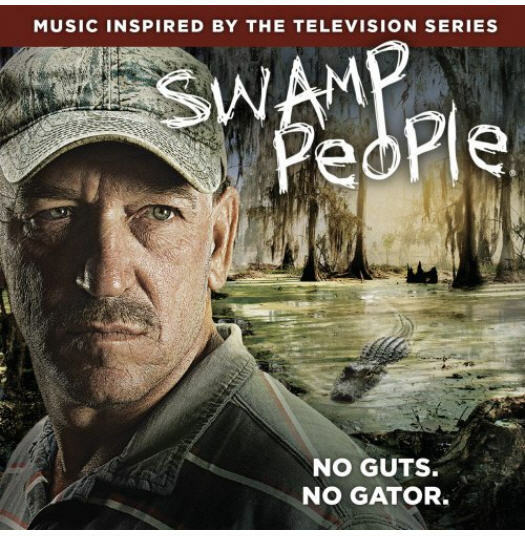 One lucky fan is going to win a Swamp people sauces kit which retails for over $50! This giveaway is open to US residents 18 and older. Enter to win in the giveaway tools below, all entries will be verified, one entrant per household or you will immediately be disqualified. Winner will be contacted via email and has 48 hours to respond before a new winner is chosen. Prize fulfillment is the responsibility of the sponsor and not the participating bloggers. Good Luck!! The Kansas City BBQ Debate. We dare to but...We are going to open comments to this blog! We debate about Kansas City BBQ & who has the best from the Ribs, to the sauce, to the sides. Weigh in this weekend, we look forward to hearing your delicious dish thoughts. Please be polite as I know we get Passionate about our favorite BBQ spot! Who is your favorite & why? Welcome to the In the News April Fool's Day $100 Gift Card Giveaway! Welcome to the In the News April Fool's Day $100 Target Gift Card Giveaway sponsored by the USA Herald, the Daily Globe, Indyposted, and the Daily Digest and hosted by The Parenting Patch. Keeping up with the news is no joke. Unfortunately, busy parents often do not have the time to sit down a read a newspaper each day. The USA Herald, the Daily Globe, Indyposted, and the Daily Digest are here to help. Each news site offers a slightly different view of the news happening around the world each day. Plus you can stay up-to-date from your computer, smartphone, tablet, or other mobile device! One lucky reader of The Parenting Patch and YOUR BLOG HERE will win one (1) $100 Target gift card compliments of the USA Herald, the Daily Globe, Indyposted, and the Daily Digest. To enter for your chance to win the In the News April Fool's Day $100 Target Gift Card Giveaway, simply use the following Rafflecopter form. Be sure to stop by each day to claim your daily entries. Good luck! a Rafflecopter giveaway The In the News April Fool's Day $100 Target Gift Card Giveaway is open worldwide. An international winner will receive $100 minus any PayPal charges via PayPal in lieu of the specified prize. The In the News April Fool's Day $100 Target Gift Card Giveaway ends at midnight CST on April 22, 2014. One winner will be chosen at random via Rafflecopter. The winner will be sent an email and will have forty-eight hours to respond. If no response is received within forty-eight hours, another winner will be chosen. The Parenting Patch and YOUR BLOG HERE are not responsible for prize fulfillment. Target is not affiliated with the In the News April Fool's Day $100 Target Gift Card Giveaway. Welcome to the Spring into Cash Sweepstakes! We have teamed up with Mom Powered Media, Mamamusing, The World of ContestPatti, Nest Full of New, The Nina Show, Growing Up Bilingual, Memoirs of a Clueless Woman, Faith Filled Food for Moms, Grown Ups Magazine and the MPM blogging networking to bring you this amazing Spring event. Two lucky winners will each receive a $250 Visa Gift Card. Giveaway ends April 10th at 11:59pm, open worldwide, ages 18+. Only one entrant per household. Winner is subject to eligibility verification. Winners outside of the US will receive $250 via Paypal instead of the Visa Card by mail. Complete each task on the giveaway form below to earn entries. INSERT RAFFLECOPTER HERE Disclaimer: The participating bloggers were not compensated for this post. We are not associated with any of the companies named above. No purchase is necessary to enter. One entrant per household. Void where prohibited by law. The odds of winning are based on the number of entries received. Confirmed Winner(s) (by Random.org) will be contacted by email. Winner(s) have 48 hours to respond before a new winner is chosen. The sponsor(s) will be responsible for product shipment to winner(s) of this sweepstakes. My blog is not responsible for product shipment/delivery. This event is in no way administered, sponsored, or endorsed by, or associated with, Facebook and/or Twitter, Google, Pinterest. This disclosure is done in accordance with the Federal Trade Commission 10 CFR, Part 255 Guides Concerning the Use of Endorsements and Testimonials in Advertising. Contact teri@mompoweredmedia.com if you have any additional questions or comments. Healthy Eating $25 Panera Gift Card Giveaway! $25 Panera Gift Card Giveaway! Healthy Eating $25 Panera Gift Card Giveaway! Welcome to the Healthy Eating $25 Panera Gift Card Giveaway sponsored by Social News Daily and hosted by The Parenting Patch. One lucky reader of The Parenting Patch, Social News Daily, and YOUR BLOG HERE will win one (1) $25 Panera gift card. Panera offers delicious, healthy, natural foods to keep your body in tip-top shape. To enter for your chance to win the Healthy Eating $25 Panera Gift Card Giveaway, simply use the following Rafflecopter form. Good luck! a Rafflecopter giveaway The Healthy Eating $25 Panera Gift Card Giveaway is open worldwide. An international winner will receive $25 via PayPal in lieu of the specified prize. The Healthy Eating $25 Panera Gift Card Giveaway ends at midnight CST on March 18, 2014. One winner will be chosen at random via Rafflecopter. The winner will be sent an email and will have forty-eight hours to respond. If no response is received within forty-eight hours, another winner will be chosen. The Parenting Patch and YOUR BLOG HERE are not responsible for prize fulfillment. 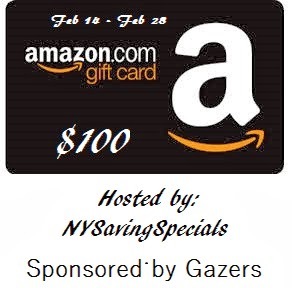 $100 Amazon Gift Card Giveaway! Make it a Happy Entry Day! Welcome to the Crazy Cupid $25 Amazon Gift Card Giveaway! Welcome to the Crazy Cupid $25 Amazon Gift Card Giveaway sponsored by the USA Herald and hosted by The Parenting Patch! One lucky reader of The Parenting Patch and the USA Herald will win one (1) $25 Amazon gift card. To enter for your chance to win the Crazy Cupid $25 Amazon Gift Card Giveaway, simply use the following Rafflecopter form. Good luck! Happy Valentine's Day! a Rafflecopter giveaway The Crazy Cupid $25 Amazon Gift Card Giveaway is open worldwide. An international winner will receive $25 via PayPal in lieu of the specified prize. The Crazy Cupid $25 Amazon Gift Card Giveaway ends at midnight CST on February 15, 2014. One winner will be chosen at random via Rafflecopter. The winner will be sent an email and will have forty-eight hours to respond. If no response is received within forty-eight hours, another winner will be chosen. The Parenting Patch and YOUR BLOG HERE are not responsible for prize fulfillment. Monster Jam Ticket Discount & Family 4 pack Giveaway in Kansas City! Win Monster Jam Tickets & get a $5 OFF Discount code! Brought to you by Feld Entertainment at the Sprint Center in Kansas City. Rev up the kids! Monster Jam is revving up their best BIG Trucks and bringing them into the Kansas City Sprint Center . They will bring on Grave Digger, Batman ( First Time Ever ), King Krunch, Rap Attack, Spike, Thunder 4x4, Mega- Bite & Nitro Hornet. The whole family will be entertained throughout the day or night event. There will be thrilling side by side competitions along with Freestyles. At most live events, Monster Jam trucks face off in two different forms of competition — side-by-side racing and freestyle. Racing is traditional bracket racing, where the first truck to cross the finish line with the least number of penalties is the winner. The freestyle competition allows drivers a limited amount of time on an open floor to show off their skills as they finesse the huge machines in a jaw-dropping display of punishing stunts and amazing tricks that make these high-horsepower beasts appear to dance gracefully across the track. Discount info: KCMOM for $5 off tickets (Valid on $26, $20, $15 tickets) Go to this link and put in the KCMOM code to choose your performance and tickets. Expires Thurs, Feb. 6 at midnight. Shows are Friday 2/7 at 7:30 p.m., Saturday 2/8 at 2 p.m. and 7:30 p.m., and Sunday 2/9 at 2 p.m. Enter to WIN a Family Four Pack by entering your favorite truck name on our Giveaway form here. We will announce our Winner Wednesday evening on Facebook & www.ebcoupons.com.